Britain's most spectacular caves and legendary home of the infamous Witch of Wookey. Wander through the prehistoric valley of the Dinosaurs featuring King Kong and relax in our magical fairy garden. The 19th Century Paper Mill houses a variety of fascinating attractions including the Victorian Penny Arcade, Magical Mirror Maze, Hall of Crazy Mirrors, New Cave Museum, Pirate Zap Zone, Soft Play Areas and the World of Miniature - The Circus Model Room and Clown Museum. The West's newest and biggest play castle is here! Located in the Paper Mill, the Play Castle is a huge, new play area with slides, ball pools and much more. 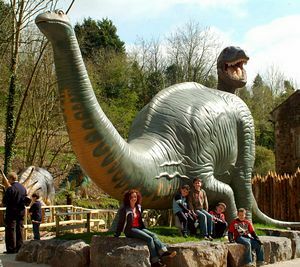 Why not stay in the Wookey Hole Hotel with packages to include over 20 fantastic attractions at Wookey Hole - located all on one complex, with easy access to the attractions, hotel and restuarant. Wookey Hole is open every day from 1st February 2013 until DEcember 2013. From M5 Jct 22 follow Brown and White signs via A38 and A371. From Bath A39 to Wells (only 2 miles from Wookey Hole).